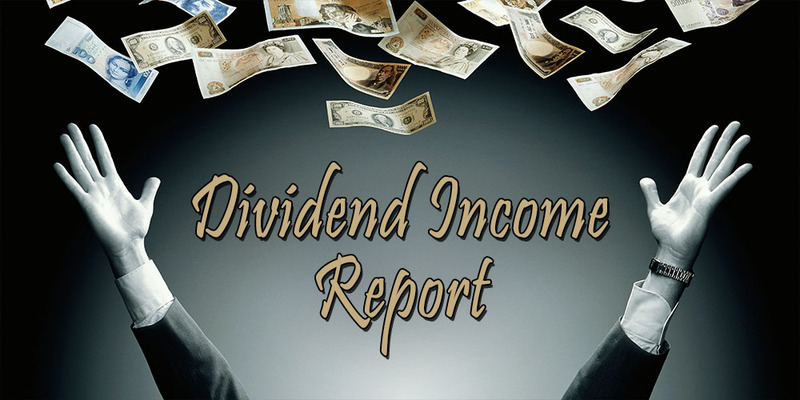 Another month, another dividend income report! February flew by like it was nothing – it felt a couple of days short actually. Work was busy as always, I’ve been under the weather for a couple of days, and I experienced a ton of fun activities with friends. On top of that, a steady stream of dividends are slowly becoming a recurring part of my life. That’s why writing these posts are by far my favourite thing about keeping this blog. Even though I’ve been less active in our community over the past few weeks than before, I still very much wish to log the journey towards financial independence and inspire others to join me. If my recent net worth increase hasn’t convinced my entire readership yet that saving and investing is the way to go, I surely hope that my growing dividend income gets you guys excited to follow in my footsteps – and please do try and overtake me. Of course, don’t expect any miracles. Building a passive income stream takes time and dedication, two things that I’ve got in spades being only 25 years old, and being a big believer of basic mathematics and the power of compounding interest. Currently my portfolio throws off only a tiny amount of money, but each penny deposited in my account feels like a major achievement. So let’s get to it! For february I’ll be presenting you guys a longer table than last month because more companies decided to reward me a share of their profits. Nothing feels as good to a shareholder as being rewarded with a small paycheck for believing in a business model. So for that reason I’m a happy camper. If February had a nickname, it definitely would be the Telecom month. American telecommunication giants AT&T and Verizon forwarded me a hefty dividend, together with British and pan-European mobile provider Vodafone. While I was able to cover just my Google Play Music subscription in January, this month my dividends also covered my internet bill. Amazing, right? €27.69 worth of real and tangible purchasing power through past decisions not to spend my entire paycheck, but rather to save a large majority of it and invest the difference. Slowly the graph below is moving to the right more and more. After having received my very first dividend in September of last year, the months and dividends are now gradually piling up. As such, it won’t be long until I can provide you guys with the first year-over-year comparisons to show off the growth component of dividend growth investing. Nevertheless, I’m happy with where I’m currently at. Considering that most of my holdings have a quarterly payout scheme, it’s impressive to see February’s income shoot up by a little over 206% from three months ago. As I continue to shovel money in the market, future dividend income is likely to experience maintained growth for the foreseeable future. 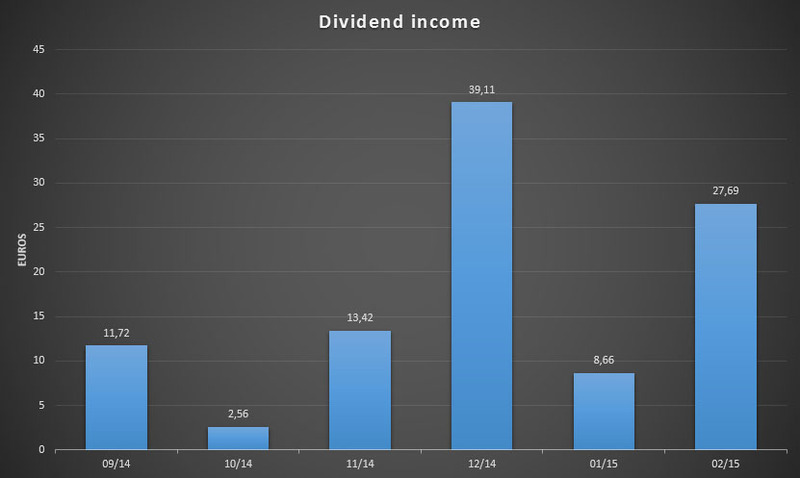 My goal for 2015 is to manage a passive income stream through dividend growth investing of at least €500. At the moment I’m a long way off to achieve that objective, but the year has just started of course. On top of that, most of my European holdings don’t pay a quarterly dividend, which is why I expect to make big strides towards the 500 mark over the coming weeks. Because dividend growth investing is very much passive in nature, there’s not much I can do to crush my goals faster than continue to invest my salary’s surplus into high quality and strong value business like I have in the past. That’s why I have added Hoffman-La Roche (VTX:ROG), the biggest Swiss health care and pharmaceutical company, to my portfolio today. With it’s upcoming ex-dividend date I’ll also be able to count Roche’s 2015 distribution towards my €500 goal. I still feel like there are exciting times ahead for us dividend investors, just like when I first started out not too long ago. Month after month the incoming dividend payments show me that financial independence isn’t just a far off dream but rather a definite possibility. I hope you feel the same way too and that February was another hallmark month in your progress towards financial freedom. Please let me know in the comments if you feel like February was another step in the right direction for you. The only thing pushing me forward more than seeing my own passive income jump, are encouraging and inspirational reports from others! Thank you for reading. Like you dividends has becoming my favorite topic/post of the month as I see it as result of hard labor, patience, and investing strategy. Keep up the great job! It’s great to read and write about dividends, isn’t it? They get me all excited about investing and progress towards financial independence – something I was missing with my previous strategy. Another free of work pay check in Feb, well done! And that is going to happen every year at growing rate like a Swiss clock! As for you, next week we will sait our Roche dividend check after the ex date. But with an extra quantities of share for next year distribution as we are going to increase our position by ~50k. As you already know, I did splurge on Roche before the ex-dividend date, which will boost up my 2015 income significantly. I noticed today that the stock bounced back up after the dividend payment, so I guess it was a good idea to do so. Wish I could increase my position to 50k though! Definitely keep saving and investing and your income will surely grow. Everyone keeps mentioning the 25% tax, ha. At first I thought it sucked too, but there’s nothing I can do about it and I’m used to paying a lot of taxes, so it’s fine. Nothing beats an excellent social safety net and health coverage like we have over here. It’s all about that growth for sure. Woot, look at those dividends! Keep at it. It’s incredible how fast those dividends grow, even with the taxes over here. It’s one thing to see someone else’s dividend income skyrocket, but to experience it yourself is another story entirely. Haha…it sure is a telecom month. Congrats on the dividend income…keep it up! Congrats on a great month! I’m sure it’ll be even more motivating when you can start doing real month to month comparisons and watching the numbers increase from the previous year – not long to go now for that. You’re absolutely right that I’m looking forward to my first month-to-month and YoY comparisons. Quarterly growth in the 200 to 300 range sure is awesome, so I can’t wait to see those numbers YoY. Thank you for being a huge inspiration! Don’t worry about your dividend income this month. The start might be slow, but boy does it shoot up like a rocket over time. You’ll get there, just hang in there! Keep up the good my friend. It’s so encouraging watching monthly and annual increases over time. It just doesn’t get boring. You’ve made a nice start to year and I wish you all the best with your Dividend Goal this year! The increases have been phenomenal so far, can’t wait to see what’s next for us. Dividend growth investing truly is an amazing strategy if you stick to it. Hope you’re well over there too and that you crush your goals this year! I think that could help offset your phone bills there, a sync with the telecom month!!! Great job and keep it going. Looks like we have PG in common for dividend income. You are doing well and as you mentioned your young age will serve you well in ten and twenty years. I can see your future self being a much less stressed person regarding income as you would have built up a fantastic passive income stream over the years. Keep on building. PG has been great to me so far, so I’m glad you’re on board too. I hope to increase my stake in the future. If your performance and the results of others who have been going at it for much longer than I have is any indication, I’m sure my future self will be really happy about my efforts now. The growth component of dividend growth investing is truly remarkable and I’m glad to have stumbled upon it. 206% growth since 3 months ago is excellent. If you keep that pace up, you will achieve your goals within no time at all. Solid performance in February and I look forward to the next one already. Ha, too bad growth slows once absolute numbers grow, but that’s one of the best first world problems we can run into. That doesn’t mean I don’t hope to keep up triple digit growth for a few more months though. Great progress! Well done! The infrequency of Euro stocks does make income a little “lumpy”. Luckily in the UK semi-annual or quarterly is the norm. Obviously the US is the best for consistent quarterly dividends! The tax cost is pretty painful. Fortunately, in the UK with dividends from UK stocks the tax is only 10%. This is especially the case with investments held in the tax-free ISA accounts. It does add up over time. The downside to European stocks is the lumpy dividend payments indeed, but that’s a minor inconvenience all things considered. More and more European companies are switching over to quarterly payments I’ve noticed, so who knows in a couple of years European stocks will be as attractive as US ones to build a stable income. Yes, there does seem to be a trend amongst the bigger companies with large non-UK/European investors to shift to quarterly dividends. Of course, the most recent I have noticed is Imperial Tobacco. I don’t personally mind it, to be honest. Currently I am not living off my dividends and I am reinvesting them. As a result, for a small capital investor like me the bigger semi-annual as opposed to quarterly dividends are actually quite useful as I am more likely to receive enough to buy further shares even with the larger value shares. I do agree with you. I find it comforting to know that my taxes (of all forms) are going somewhere good (for example, the NHS). I think a lot of it depends on to whom the taxes go. 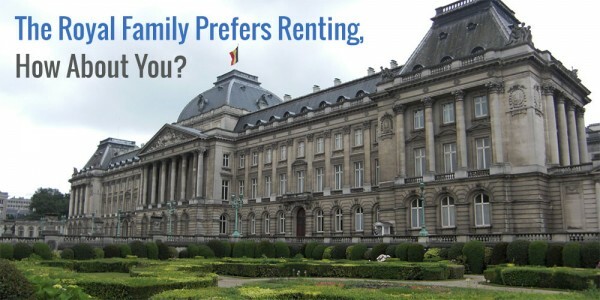 If it is your own government–and thus one you benefit from–you are usually more willing to pay. I suppose it is a sort of tax version of a “Home Bias”. A vast majority of my investments are in tax efficient vehicles like ISAs. I currently have little chance of easily maxing out the £15,000 a year allowance for this. However, if I ever find myself able to do that I would be equally happy putting it in a taxable account. As you say, it isn’t the end of the world! If you’re investing income is so fragile to be wiped out by taxes then you have probably got something wrong somewhere along the line! PS: Thanks. It needs to be tinkered with a little. I put it together months ago but it still feels unfinished. It was a procrastination exercise! Some strong quarter over quarter growth here, so you’re progressing quite well. 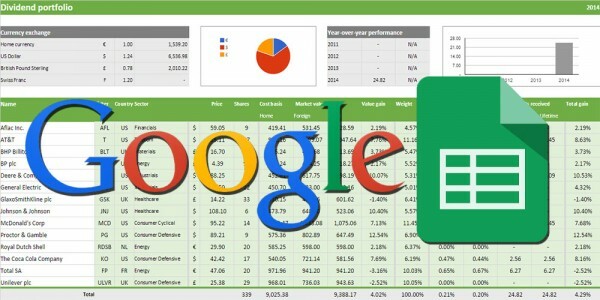 I love comparing my dividend income to the ‘bills’ it would pay. Brings a level of tangibility to things that didn’t exist before. Keep up the good work! Progress has been stellar indeed, hope to keep it up for the foreseeable future! You hit the nail on the head! That’s why I love dividend growth investing so much. Not only is the growth component fantastic, the fact that I can actively monitor how far I’ve progressed towards FI is what really motivates me to push things farther. Keep it up over there too, you’re doing fantastic yourself. Bravo cher ami. Don’t we love those free dividends rolling in! 😉 Lâche pas! Thanks for your nice update and blog ! If you later come at a stage where you have enough money, you can still exchange these funds/ETFs for real shares which actually generate an income. That’s my perspective at least : as long as I don’t need the extra income, I try to avoid the dividend part. That is my approach as well. For now, I go with capitalizing ETF. At some point in time, I will swap to dividend investing. Belegger, that’s the best way to reduce taxes indeed! You’re right that ETFs would probably be more tax efficient, but I don’t want to adjust my strategy based on an external factor like taxes alone. What’s most important to me is that I feel good about my strategy and that it keeps me going. What you’re doing is the best way to minimize taxes and increase returns, don’t you worry about that! Any income I did not have to work (at least in the present) is good income. So February was good. Just need to get the post up. Great to hear you had a good dividend income month! What’s not to love about work-free income? Ha, we seem to have moved along the same path. First accumulating ETFs, then dividend growth stocks! The monthly income makes it so much easier to track progress towards your goal, so I’m happy I switched over. Nice month, way to beat the same month from the prior quarter. Keep it up, looking like next month should really be a strong show! Those taxes from a distance are brutal, but I like it in a way. It is better that tax is deducted automatically, as opposed to having certain taxes deducted here and there, then having to go back and add it all up at the end of the year. The US should do that, but no one is willing to ever submit to that style even with a graduated style-flat tax. We love to make things over-complicated. March, April and May should all prove to be really good months with my European holdings chipping in a full-year dividend or half-year dividend! Looking forward to the growth. Taxes are high over here, but that’s OK. I’ve said it before, but I gladly pay towards good health care and social security rather than never paying any taxes but being left to your own devices once something happens. The automatic deduction makes things a lot easier indeed. No hassle, no fuss, just net dividend income to keep track off. The snowball is indeed growing bigger and tumbling faster downhill! Let’s hope it turns into an avalanche before long. Great progress for you. Albeit I don’t receive dividends every month, I can imagine your happiness about monthly passive income. I like also Roche a lot and I have them on my watch list. 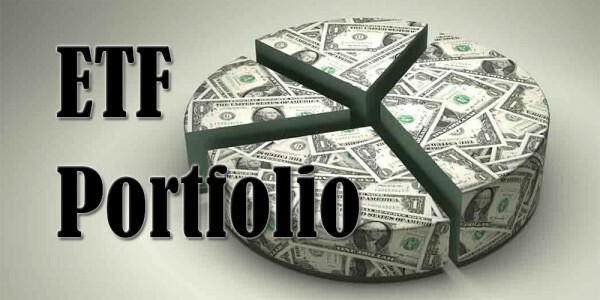 Once your portfolio grows in size and you add overseas stocks your portfolio will start to throw off monthly income too. It’s the one downside to European stocks in that they don’t pay quarterly. Roche is a great company and I hope it continues to do good for the foreseeable future. Can’t wait to call you a fellow shareholder! 206% increase from last quarter is pretty awesome brah! Keep that momentum going my friend. Thanks, Ace! Pretty awesome indeed! Great job on building your dividend passive income. As you mentioned you’re young and you’re determined. This is a great recipe for success! Thanks for the update. Determination is by far the most important factor in seeing the financial independence effort through. My age is just the icing on the cake.